Stevia is an ancient herb with a sweet taste, which is the best possible substitute for sugar. Stevia is 300 times sweeter than sugar although their taste is similar. It contains no calories and it is very healthy. The stevia health benefits include its ability to aid in weight loss, lower blood pressure, reduce blood sugar, protect oral health, build strong bones, prevent certain forms of cancer, and help avoid cavities. Stevia (Stevia rebaudiana) is a perennial shrub. Due to its sweet taste it is known as “honey herb“. This herb is far more useful than all sweeteners (even natural), but has been banned in many countries, although there is no real evidence of adverse effects from the use of this herb and the stevia health benefits are huge. The only concerns are that at higher doses of stevia may result in lowering of blood glucose and blood pressure, which would not be completely safe for people suffering from such problems. The World Health Organization defines stevia as completely harmless. It seems that another paranoia of some scientists or unfair competition from producers of artificial sweeteners will be the prohibition of the honey herb in many countries. History of stevia begins in ancient times from the Guarani Indian tribe. They called stevia “ka’a he’ê” (“sweet herb”). Guarani brewed stevia tea, which they drank for its healing effects or chewed leaves of the honey herb to leave a sweet taste in their mouth. By 1800 it became widely popular throughout Latin America and in Europe it was presented by Italian researcher. 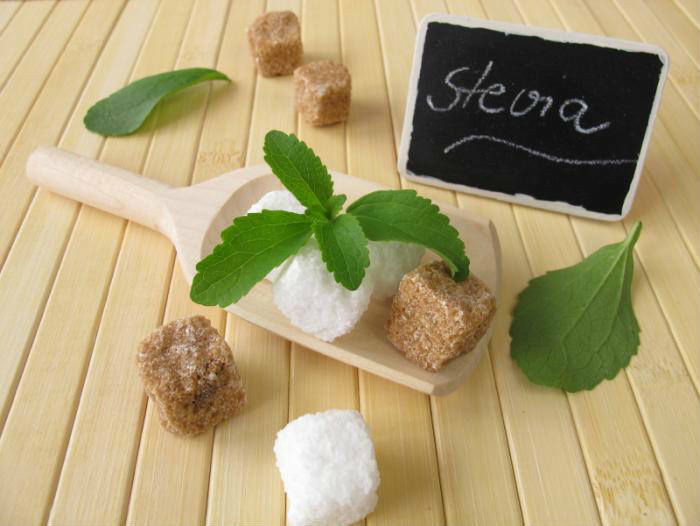 The largest consumers of stevia worldwide are Japanese, who used it as a sweetener since 1954. Therefore in Japan, the export of this herb is banned and more products are produced with stevia instead of sugar. In the United States stevia had difficulties to be accepted, because of the interests of producers of sweets and artificial sweeteners. After long scientific debate stevia was approved as a food additive in the United States. In contrast to artificial sweeteners stevia replaces sugar with absolutely no health risk. On the contrary, this sweet herb is extremely useful. It is rich with steviosides (sweet glycosides), which are involved in the metabolism (but not containing insulin) and normalizes the blood sugar levels. This herb helps in improving the situation of people that suffer from high blood pressure and it is used in type 2 diabetes treatments. It is recommended consuming steviol glycoside in amount of 4 mg per kg body weight for these people. Stevia also contains vitamins (A, C, vitamins of the group B), minerals (potassium, zinc, iron, calcium, magnesium and selenium), amino acids, pectin, fibers, etc. Even though it is strong sweetener (300 times sweeter than sugar), stevia has no calories. Controls Diabetes – The most important or widely praised aspect of stevia for human health concerns its ability to regulate blood sugar levels in the body. Opposed to sucrose, which is what normal table sugar consists of, stevia sweetens food in a similar way as sugar, but it contains stevioside, which is a non-carbohydrate glycoside compound. As explained above, when stevioside breaks down, the glucose-containing particles are absorbed by the bacteria in the colon, rather than being absorbed by the bloodstream and affecting glucose levels in the body. This is an ideal replacement for normal sugar for diabetics or people on carbohydrate-controlled diets, because they can eat sweet foods without having to worry about diabetic complications. Prevents Cancer – The wide range of antioxidant compounds found in stevia make it an ideal dietary supplement for cancer prevention. Quercetin, kaempferol, and the other glycoside compounds in stevia help to eliminate free radicals in the body, thereby preventing them from mutating healthy cells into cancer cells. Antioxidants also help to prevent premature aging, cognitive malfunction, and various other serious conditions like heart disease. Promotes Oral Health – Gingivitis is an infection of the gums caused by bacteria. As stevia contains antibacterial and inflammatory compounds, it prevents the colonization of bacteria in the mouth and around the gums thereby hindering the formation of cavities and plaque that predominantly contributes to the onset of gingivitis. Reduces Wrinkles – Stevia contains a compound called retinoic acid that thwarts the progression of wrinkles. It works by inhibiting the breakdown of skin cells mainly collagen and elastin. Moreover, it reduces sebum production and also enhances the lifespan of the skin cells. Treats Dandruff – Stevia concentrate is believed to be beneficial for dandruff, dry scalp, and dull, dry and thin hair. People have noticed stronger, dandruff-free and rejuvenated hair after the regular use of Stevia. Simply mix 3-4 drops of Stevia concentrate into your regular shampoo and wash as normal. Also, after shampooing, using stevia tea as a conditioner and rinsing it out after 5 minutes can help retain natural hair colour and strength. Regular use of stevia as a sweetener can normalizes the level of blood sugar and the level of insulin. Stevia can improve the condition of the cardiovascular system. Honey herb reduces the level of “bad” cholesterol in the blood. It has atoning effect and strengthens the immune system. Honey herb improves the functioning of the gastrointestinal tract. This herb is useful for the liver. Stevia shows positive effects in osteoporosis therapy. It is used in type 2 diabetes treatments. Honey herb protects the teeth and gums from dental caries, gum disease and other diseases. I has antiseptic and anti-inflammatory action. Stevia calms down the nervous system. Honey herb is a powerful antioxidant and reduces free radicals. Stevia helps to clean toxins from the body and is used for detoxification. Although it is very sweet, it does not contain calories. Substances in stevia are not fermenting in the mouth, i.e. does not increase appetite. Furthermore it improves the digestion and metabolism.